A chicken showed up in my yard this week. Yea you heard me right, a chicken. Like a real live breathing chicken. When I first saw it I felt like Piper from Orange is the New Black when she saw the chicken on the prison grounds, mainly because when I got all excited and yelled for the kids to see, it disappeared into a bush and they just thought I was crazy. When I told Matt about it, he asked if I asked why it was crossing the road. 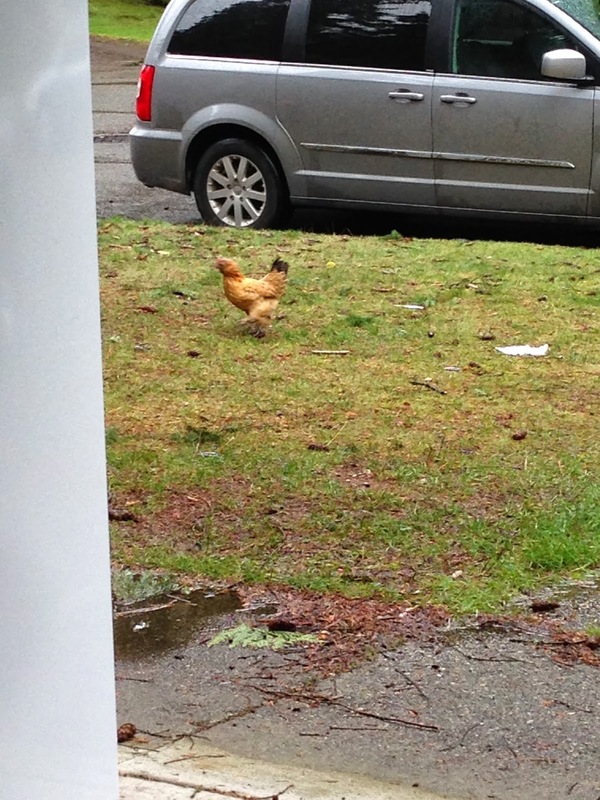 Obviously he doubted my chicken sighting so I was elated when the dang thing ended up in our front yard Sunday. I'M NOT CRAZY! And I have photographic evidence to prove it. And now I just don't know what to do about it. She doesn't do anything but wander our cul-de-sac. But I find it fascinating regardless.